The circumstances of this artistic collaboration is nearly as intriguing as the depiction in the film. David Oyelowo spent seven years preparing the path to his role as Dr. King, and was instrumental in getting Ava DuVernay – a television and independent film director – onto this major film project. The result is a showcase of humanity, exposing the raw events of a minority struggle against a power that wanted to continue to deny them their inalienable rights (according to the Declaration of Independence). The events of “Selma” led to major legislative reforms in equitable voting for African Americans, which echoes all the way to Ferguson, New York City and the ballot box today. HollywoodChicago.com interviewed the David Oyelowo and Ava DuVernay via phone, in an in-depth discussion regarding their passion within the project, which included media powerhouse Oprah Winfrey as both actor and producer, and some recent controversy about the portrayal of President Lyndon Johnson in the film. HollywoodChicago.com: Ava, this is a major film for you, after TV and independents. How did you petition to get the director’s chair for this story, and what was in your pitch that sealed the deal for you? Ava DuVernay: I never pitched for this film, it was pitched for me by the person sitting next to me, David Oyelowo. He pitched me to the producers, and really went to bat for me. My previous film was a 200,000 dollar independent, I’d never done a major feature or a period piece. But David believed in me so much, and he went to them with so much passion, that they called me and asked if I’d be willing to explore it. That’s basically what it was. HollywoodChicago.com: David, describe the first time you looked in the mirror when your transformation to being Dr. King was complete, what meditation or thought came to your mind? 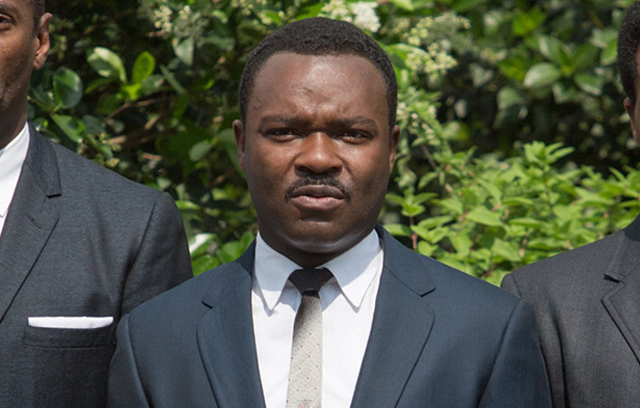 David Oyelowo: Inevitably, it was a gradual process, but that moment did indeed happen. The process of assimilating as much as possible, to what Dr. King looked like, involved weight gain, growing the right mustache and shaving my hairline back. But it was a group effort. Ruth Carter, our costume designer, noticed a particular quirk of Dr. King – he seemed in denial regarding his collar size on his shirts. Ruth came up with this genius idea of having the collars be a little tight, and a little high. Everything came together to give me as close a proximity to his look as possible. This helped me toward the spiritual and emotional habitation of him as well. This was also gradual and admittedly at times unsettling. HollywoodChicago.com: Ava, the white actors in the film were asked to do some heinous acting bits. What conflicts did you have to resolve in their souls, in order to get the proper push back in the elements of the crucial riot scenes? DuVernay: It wasn’t easy, because the actors were not in the emotional place that the white folk at that time and place were in. Back in 1965, there was real conflict and pain going on, and that’s something that the actors had to understand. It was not only the main players, but the background people and extras. HollywoodChicago.com: David, you grew up in the British culture, and not within the attitudes towards people of color in certain sections of America. What was frightening to you about this circumstance, when you did your research about the 1960s, and why do you think Americans can generate such hatred toward their brothers and sisters more than other cultures? Oyelowo: I think that the legacy of slavery is far reaching, and America is still living that legacy. One of the things I observe, as an outsider looking in, that there has never been an acknowledge or repentance regarding slavery, and how wrong it was – an intense, deliberate and prolonged wrongness, that played against all Americans. In the film ‘Lincoln,’ I played a black soldier, alongside the actor Colman Domingo – who portrayed Ralph Abernathy in ‘Selma.’ In my dialogue with President Lincoln, portrayed by the brilliant Daniel Day-Lewis, I asked him in year 1865, ‘when we going to get the vote?’ In ‘Selma,’ it is 1965, I’m sitting next to the same actor in a jail cell, asking the same question, one hundred years later, almost to the day. HollywoodChicago.com: In your opinion, does that also echo to today? Oyelowo: Yes, and here we are now, 50 years later, the voting rights act has been dismantled, on the reasoning that the country has changed enough not to find it necessary. The short answer to your question is that this is a painfully prolonged and systemic problem in America, in terms of the marginalization of black people, and we’re still in it. 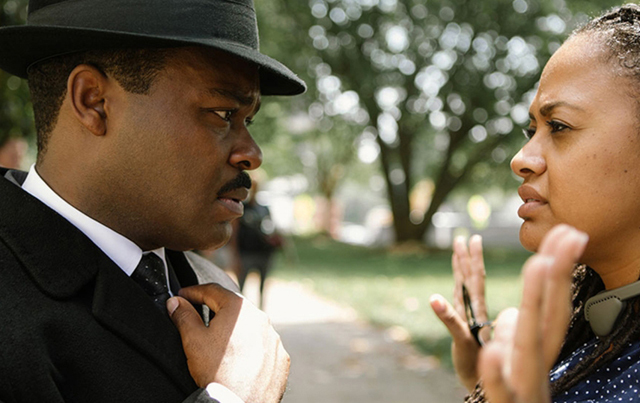 That’s why I’m grateful to have a film like ‘Selma,’ in order to have a continued conversation. HollywoodChicago.com: Ava, it seems that Oprah Winfrey is using her post-talk show life to tell stories of the African American experience in America. Her scenes were very powerful and truthful. What does she understand about America that you believe nobody else understands? HollywoodChicago.com: David, what do you think the key is to humanizing Dr. King? Even though he is a somewhat contemporary figure, he’s been given in to all interpretations, including a practical sainthood. Which interpretations of your research helped you to find him best? Oyelowo: The key for me was director Ava DuVernay, who brought to this particular script all of the moments doing just that – humanizing a multi-interpreted man. She instigated the crucial moments between Dr. King and his wife Coretta regarding the FBI investigations, plus the doubts that occurred between him and his colleagues. These are the moments for me as an actor, going from portraying such a public figure to simply portraying a man. What was amazing is that Ava’s vision for the film was lining up with my research, especially in talking with Andrew Young, who knew Dr. King intimately. He gave me clues and hints to King’s humanity, as well as showing me some unseen footage that he had. These were all the things that make the film a far more satisfying experience, because it goes from something that validates what you think about Dr. King to what you can relate to in regards to him and the movement. HollywoodChicago.com: Ava, one of the strongest points of your film is the performance of Tom Wilkerson as Lyndon B. Johnson. What do you personally think of LBJ, given the schizophrenic nature of his administration with assassinations, the civil rights movement and Vietnam. Was he a great man, or merely a politician? DuVernay: I have a complicated relationship with President Johnson, but the short answer to that question is that he was being a politician. He did some great things, but was forced into them. When you look at history, I do not believe that the Civil Rights Act of 1964 nor The Voting Rights Act of 1965 would have happened without the external pressure of the civil rights movement. We tip our hats to Johnson, because he did the right thing, but I would stop short of saying he was a champion to those events. He was a willing participant in a movement that had its own momentum, and he definitely played his part, and will go down on the right side of history. But we also can deconstruct the events of the time as to how and why it happened, and that was because of the civil rights movement. HollywoodChicago.com: David, this is a story of African American men going to a symbolic war in perpetuating the movement, and taking risks against a society that doesn’t want them to do what they did. What discussions did the men who portrayed your entourage have about the importance of honoring the brothers that had fought that war? Oyelowo: Each and every person who came to this film, I can truly say, came as an act of service to the band of brothers and sisters, and their story. In contrast, my generation suffers from apathy and a ‘man-child’ complex. Manhood was represented very differently back then, there is an obsession with youth right now that has belittled what it means to be mature and socially responsible. When you hear Dr. King speak as a 26-year-old, during the Montgomery bus boycott, it’s incomparable to any 26-year-old that exists today. Each and every one of King’s entourage, they were young men and women who were changing the world around them, and we as actors – who were afforded the opportunity to play these roles – were very aware that we were playing people who were huge inspirations. We sought to imbue them with that sense of pride, and the admiration we had for them. I know that every person that portrayed these activists were moved by them. HollywoodChicago.com: For both of you, when in your lives did you first discover there was a ‘color divide’ in the consequence of your birth, and how do you feel it adjusted your human experience? DuVernay: For me, I would have to say that the awareness was really ambient, I don’t remember a particular moment. For Oprah, being older, she could pinpoint those particular moments. I was born in 1972, grew up in Compton, California, and my parents were what they used to call ‘race people’ – very proud of their culture and color. It was always a part of our family life. The overt racism that my parents experienced was not so much a part of my life. I had institutional moments that came up, like in high school when there were certain things that happened because I was ‘the black girl,’ but it wasn’t overt. Oyelowo: I was born in Britain, and moved back to my parent’s native Nigeria at the age of six, and lived there for seven years. Going from a society where I knew I was a minority, even at a young age, to a Nigerian society in which every opportunity afforded me was open to me. I could see the difference in my bearing walking as a person in Nigeria to afterwards moving back to Britain at the age of 13, and even more acutely so moving to America seven years ago. So I’ve had the opportunities to not be a minority and to be a minority, it makes a difference – in how you carry yourself, how you perceive your ambitions and how much you have to break down walls in order to achieve those ambitions. It’s real. Racism is real, inequality is real and a ‘minority mentality’ that blocks us from where we want to go is real. But what is also real is the beauty of who we are as human beings, as black people, and what we have to contribute to society. Our human spirit is stronger than the forces that oppose us, and I have a true belief in that – and that’s what I expect to live with everyday, to defy whatever injustices I may face. 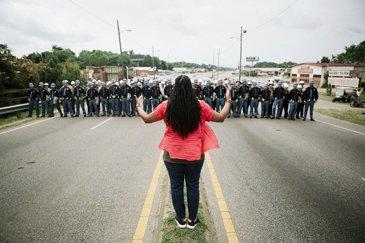 Click here to read Patrick McDonald’s full review of “Selma,” opening everywhere on Friday, January 9th, 2015.